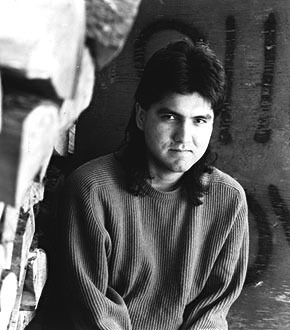 It’s easy, and fairly offensive, to write off Sherman Alexie’s fiction as nothing more than an anthropological curiosity. He’s that guy who grew up on an Indian reservation and writes about what it’s like to be an Indian! Yeah! That’s not fair, of course. His work offers far more than mere ethnic perspective. At the same time, I’d like to take this blog entry to highlight that ethnic perspective and present as an important magic trick in itself. Not the only redeeming quality of his stories, but certainly one that bears mention. “The Only Traffic Signal” discusses a topic that you just don’t see too much in fiction – basketball. Specifically, it’s about the way a small, underprivileged community can come to put all of its redemptive hopes onto one kid who happens to be good at basketball. His journey toward success becomes that of an entire group of people, living vicariously through a mere child. It’s sad and that sadness comes through beautifully in this story. And that’s quite a trick on Alexie’s part. It’s hard to be optimistic on the reservation. When a glass sits on a table here, people don’t wonder if it’s half filled or half empty. They just hope it’s good beer. Still, Indians have a way of surviving. But it’s almost like Indians can easily survive the big stuff. Mass murder, loss of language and land rights. It’s the small things that hurt the most. The white waitress who wouldn’t take an order, Tonto, the Washington Redskins. And, just like everybody else, Indians need heroes to help them learn how to survive. But what happens when our heroes don’t even know how to pay their bills?